A mountain climber is climbing a mountain. For every minute that he climbs up the mountain, he ascends 75 ft. He stops to take a break after 5 minutes of climbing the mountain. Independent Variable- The independent variable in this scenario is the time (Minutes). Def- A variable that does not depend upon another variable. Dependent Variable- The dependent variable in this scenario is the total feet he ascends. Def- A variable that depends upon another variable. (Ex. How many feet he ascends up the mountain depends on how many minutes have passed). Constant- How many feet he ascends per min (75 ft./min). Def- The number that stays the same in a scenario. 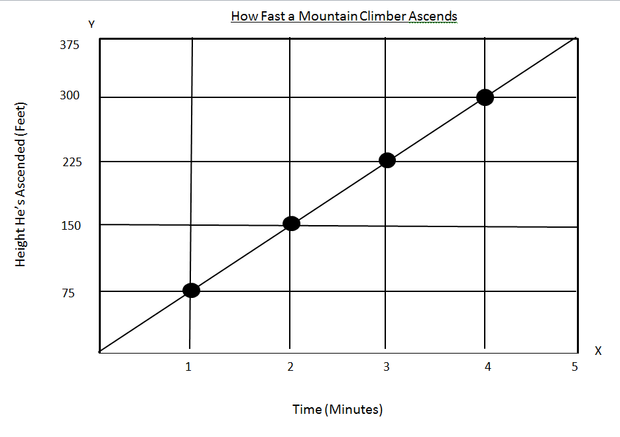 In this graph it shows a mountain climber ascending up a mountain at a steady rate of 75 feet per minute, as he gradually increases.